Whether you're #TEAMFIRM or #TEAMSOFT, we have a premium memory foam mattress that works for you. Our premium stretch-knit fabric cover with spun poly fibers that’s breathable and durable with a soft feel. Our high-quality memory foam adapts to your body size, shape and sleep position to ensure a great sleep no matter which feel is right for you. Choose our soft layer for a cozier, more “in-the-bed” feel. Choose our firm layer for a sturdier, “on-the-bed” feel. Engineered to be highly durable and resilient. We’ve tested it, and we know it bounces back every time. A mattress in a box? Slide the compressed mattress out of the box. Place the rolled mattress on a flat, sturdy foundation. Remove the tape and pull the wrapper apart at the seam. 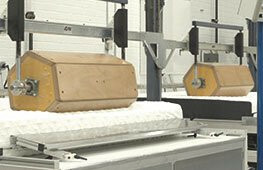 Your mattress will reach near-full shape after 1 minute. "They brought the box right to my door"
Whether you want softer or firmer, we have a premium Sealy memory foam mattress that works for you. "The mattress breathes nicely, which keeps the bed cool"
"I wake up feeling more relaxed"